You may be unaware of the challenges you can face when you have been given a traffic ticket in Los Angeles. Even the safest drivers sometimes find themselves on the paying end of a traffic ticket, and that ticket often has a much higher price tag than what the piece of paper presents. If you decide to fight your ticket and lose, you might find court costs tacked onto the price. Don’t forget about your insurance, either. The average Angelino can expect to pay as much as $700 more for their insurance after receiving a ticket. The total fine for your ticket will vary throughout the state and county based on your age, your driving record, the severity of the offense and the type of offense. You have the option to pay the ticket and plead guilty or no contest, which includes paying for traffic school, paying the fine, providing proof of correction for a fix-it ticket, adding points to your driving record and possibly dealing with an increase to your insurance premiums. With a ticket lawyer Los Angeles, you can fight your ticket and plead not guilty. This means you have a choice to hire an attorney or represent yourself in court. You may also attend a court trial conducted by a judicial officer, have a trial by mail or a “written declaration” and you may also have to pay legal and court fees. 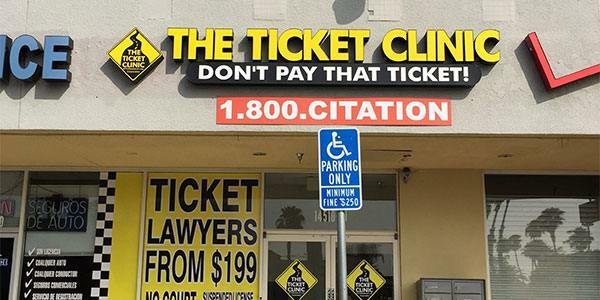 At The Ticket Clinic California, we encourage you to enter the battle with a professional on your side to avoid any of these inconveniences. The team at the Ticket Clinic is knowledgeable, experienced and licensed to practice law in the state of California. When you call us for help, an experienced legal assistant will walk you through the process. We get all the information needed to represent you in court. In most cases, you will not have to attend court. Our goal is to get your case dismissed, your fine reduced, no point and no traffic school. If you want to speak to a fight red light camera ticket lawyer Los Angeles about a traffic citation you feel is unfair or illegal, we encourage you to call us today at 1-800-248-2846, or fill out our online form and we will get back to you.